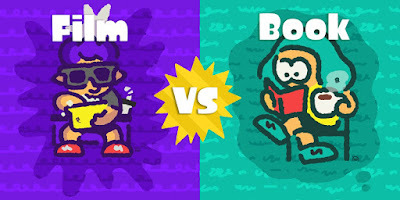 KoopaTV: European Intermission: Film vs. Book Splatfest! Under our definition of book, books at least can have pictures and STYLE. But they don't have to. Meanwhile, Pearl is discounting the whole silent film genre. The fundamental difference is how you engage with each medium. With a film, you are consuming it on someone else's predetermined schedule. Your only choice is to watch it through, or quit. There are some hacks to the medium, like fast-forwarding and skipping ahead or behind by some time unit, but you don't really know what is being missed and you're going ahead blindly. A content creator put a film together for a guided tour of their mind. It doesn't take effort on your part to go through this tour, and the pay-off is reduced. Books are much more self-directed. They usually contain more detail than film, and it is up to you how to consume it. Not a fan of filler? Skim. Want to stick around at a certain part because it really speaks to you? You're free to do it. You move at your own pace with books. An author put it together for you to explore. It takes effort on your part to explore it, and there is more reward out of it. Film goes on without you. You're a spectator to it. A book only goes when you are in that driver's seat (or cockpit, if you're a Team Plane alumni like myself). 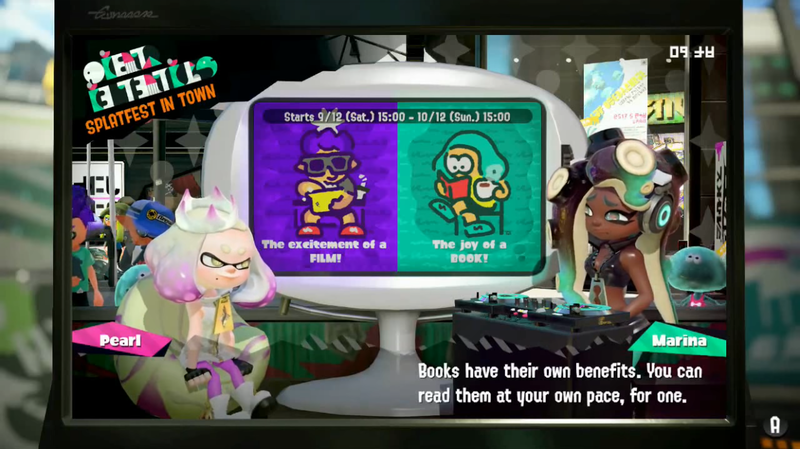 For full context, we're watching a cutscene about the benefits of reading books at your own pace. When put that way, which medium is closer to videogames? Clearly, it's the book. Games are all about the freedom that comes with control. Gamers like when there is a high amount of control over their character. Games dislike when that control is taken away from them with long cutscenes, which are basically embedded films within an otherwise non-film medium. Gamers either treat cutscenes as a reward for a gameplay segment, or as a dissonant distraction from why they got the game that they wish they could just skip. While you don't control the plot of a book, you still exert a lot of control over the pacing. In doing so, you can customise your experience with how much time you leave to mull over the details of the story as you read, and you can leave more to your imagination. Meanwhile, a film is a lot more fast-paced and has a finite duration in terms of time spent. Books and games both vary in that regard. I'm a gamer. I prefer how games do things. Therefore, because of how books and games are much more similar than films and games, I support Team Book. How about you? If you actually are a European, let Ludwig know your thoughts on Team Film vs. Team Book. Even if you're not a European, you can still let him know, but your opinion is irrelevant unless Europe exports the Splatfest to North America. KoopaTV previously wrote about the Eating vs. Sleeping European Splatfest from the first Splatoon. Since KoopaTV didn't write about America's Cats vs. Dogs Splatfest, we wrote about it when Europe ran it. The last time KoopaTV wrote about a European-only Splatfest was their Travel the World vs. Go Into Space Splatfest in the first Splatoon. Hideo Kojima believes that films and books will converge into one medium soon in the future. It'd be interesting how he tries to make that manifest. The Splatfest article preceding this included some anti-book rhetoric and a comments section argument. Ludwig has admitted that he doesn't even read books in this article. Here's the actual next Splatfest, actual being in America. It's... a lot less interesting of a topic than this one. Marina screwed up being the leader of Team Books, and Ludwig resents her. 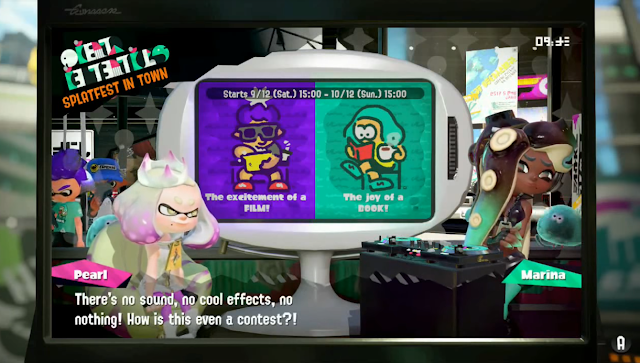 After Film wins, the next Splatfest is all about film genres. There is also the video game category which are the visual novels which includes the Ace Attorney games in it. I did not expect you to be on Team Book but now I can see why you would be on it. As a new parent it is so hard for me to go through a whole sitting of a film without stopping. Last time I was at the cinema was for Moana before I gave birth, the rest of the time I watched them on DVDs or if they aired on television, but for the latter I missed part of it because there is no stopping a broadcast to take care of THE BABY! I thought about talking about Ace Attorney as a book vs. its anime and would say the book version is infinitely better, but that's hypothetical. The DS/3DS games don't count as books under the definition of one. Books are THE BABY friendly! They have an innate pause button! As an aspiring writer, I am nigh forced to, in a very much biased and not at all objective whatsoever way, support Team Book as well. I mean, nominally anyway. I have not and will not ever actually PLAY Splatoon. How about an aspiring SCRIPTwriter? To quote one of literatures most famous protagonists:"If there’s one thing I hate, it’s the movies"
While that may be a bit exaggerated, I w o u l d choose Books over Movies any day of the year. Or at least literature, not so much cooking books, fanfic or superhero comics. Although the difference between movies and literature may not be that big, since movies are based on movie scripts, which belong to one of the 3 types of literature: drama (the other two being lyric and narrative). If you think of "books" as narrative, because 95% of books in the bookstore are narrative, you may rephrase the question movies vs. books into drama vs. narrative. So it is really a battle between one genre of literature versus another. While narrative literature was actually frowned upon in Europe up to 200 years ago (that's why the big authors of the past mostly wrote drama and lyric) it is now the dominating genre. And in this new phrasing of the question I would definitely choose narrative. So my choice goes to books. PS: You could probably even go so far as to consider video games drama. Instead of a movie script or a theater script, they have a programmed script. Interactivity & multiple outcomes are nothing completely new in theater, so it isn't too absurd to say, that video games a contemporary branch of theater. At least that's my thesis. Very thoughtful post. However, it may be a little bit too reductionist in that you are not taking the transformative nature of what happens when those scripts are enacted. People who are on Team Film aren't doing so because it is a different form of literature based on the script, but because they appreciate the production values that went into making the script come alive. As seen by Pearl's dialogue in the screenshot. I don't know what that first sentence is supposed to mean. Anyway I'm fully aware that people, who like movies or video games, don't solely like them because of their script (which is the skeleton of those media) but because of the blood and flesh surrounding it, making it a medium of it's own and in fact not just an elaborate book. My post was just another way of looking at the question and to point out that there may be an uninterrupted line from Homers Odyssey to Super Marios Odyssey. PS: "Pearl is discounting the whole silent film genre." Most silent films had unsynchronized music going in the background at all times. They just didn't have audible dialogue. Just look at "Birth of a Nation" from 1915 https://www.youtube.com/watch?v=I3kmVgQHIEY or "I Was Born But..." https://www.youtube.com/watch?v=IDy4RsxDuy4 or really any silent film. "(The reasons for this would take too much space to explore and this is not a literature blog, but a gaming blog.)" Somehow I feel like Pearl wouldn't appreciate unsynchronised music. 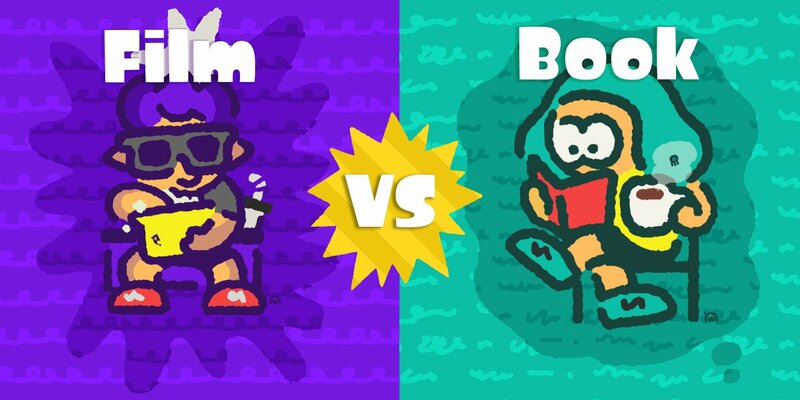 If I had to guess, Team Film will win the popularity vote but Team Book will win the overall Splatfest. A good book is more memorable than a good movie most of the time. Do you think that Team Film would have better teamwork (Team Battle) than Team Book, since films are often watched with other people and have a cast? Or are book clubs a formidable force? LOOKS LIKE I WAS SPOT-ON. This is what I FEEL though. ...Nah, I'm pretty sure you'd participate in the Splatfest because you don't need a reason to play Splatoon 2. You'll just do it. I'm actually pleased you so quickly went from "Hey Luddy what is Splatoon?" to being a junkie is so short a time period. Not sure if that last part was a typo? "to being a junkie is so short a time period." Seeing as how reading is gay, go film.